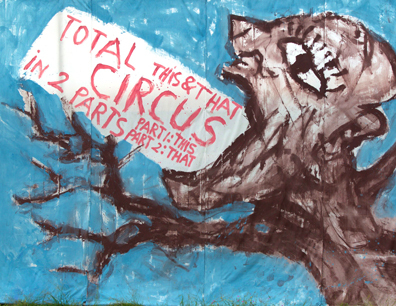 As part of a world-wide birthday celebration of "50 Years of Sublime Arsekicking Puppetry," the award-winning Bread & Puppet Theater from Vermont’s Northeast Kingdom will present their Total This & That Circus on September 1 on Cambridge Common. For the past few years, the company has resurrected that age old Harvard Square tradition of outdoor theatrical political rabble rousing. Set to take place near the intersection of Mass. Ave. and Waterhouse Street, the performance is free and will happen rain or shine. Daffodil combat forces battling F-35 jets; the elimination of the 800,001st Palestinian olive tree, totally unattended by the National Outrage Orchestra; an Animal Rental Facility, which offers disenchanted customers of civilization instant transformation into frog or deer, cricket or rat. There will also be new characters including underprivileged Corporate Dwarves, overshadowed by Ordinary 99% Giants promoting brand-new economy-shrinking ventures, while the Lubblerland National Dance Company will enhance the program with eternal values gloves-on dances presented to the gloves-off practitioners in Guantanamo and elsewhere. Pleas note that if some of the circus acts are politically puzzling to adults, accompanying children can usually explain them. The audience is welcome to examine all the masks and puppets after the performance, and Cheap Art will be for sale. Examples of Bread & Puppet’s work can be found at www.breadandpuppet.org.